On Tuesday at approximately 9:05 am patrol officers with the Auburn Police Department were dispatched to an address on Miller St on a report of a domestic dispute and the theft of the victim’s vehicle. Upon arrival patrol officers discovered that the suspect had forced entry into the victim’s residence and intentionally damaged several items in the residence. Police say the suspect then grabbed the victim’s keys from her hand and drove off in her vehicle. The suspect was located and interviewed at APD by members of the Detective Bureau. The suspect was then arrested and he led APD members to the location of the vehicle. The vehicle was located in a wooded area in Montezuma near the Seneca River. The defendant was identified as Brad H. Talbot and was charged with several misdemeanors and felonies. 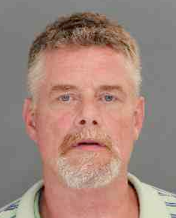 The 55-year-old Auburn transient was charged with robbery in the third degree, burglary in the second degree, and grand larceny in the fourth degree. He was arraigned in Auburn City Court and remanded to the Cayuga County Jail. The victim was not injured in the incident and there was no damage to the vehicle.